Situated between Playa del Carmen & Cancun, you would expect Puerto Morelos to be a mini tourist resort, similar to its big brothers; It’s not. In fact, its popularity is due to visitors who shun the ‘all inclusives’ & touristy resorts. Morelos is a quietish town which is popular with retirees & still retains its fishing village roots. Holiday makers tend to stay in the private apartments or privately owned homes which line the white sandy beach. 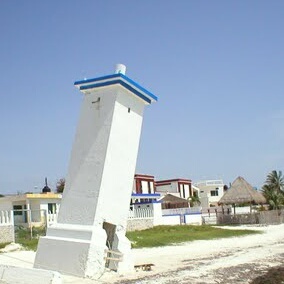 The only large hotels are situated outside the town on the stretch of beach towards Cancun. The town has a relaxed atmosphere where families & locals drink coffee or a beer, in the many relaxed restaurants & cafes in the two roads which lead from the central square. The prices here are much cheaper than its neighboring big brothers; although accomodation is pricey for a backpacker looking for a room. The main draw is the close proximity to the Mesoamerican reef, the area has been designated a natural park. It makes the town a draw for snorkelers & divers. You can take boats out to the reef (2hrs) to snorkel for approx $21 including equipment. It takes about 10 mins to the reef, which you can see from the beach clearly. The old light house, also makes for a good photo. Hit by Hurricane Beulah in 1967 it started to lean & a couple of others have had their own impact. The town is surrounded by marshy mangrove & forest area, which makes for good wildlife watching (& unfortunately a big mosquito problem). If you are travelling along the coast between Playa del Carmen & Cancun (20 min from both), we strongly recommend stopping off in Morelos.